Production not far from consumption. While most oil for US lifestyles is imported, some is produced locally in places like Southern California. Thinking about my last post for a tax on imported oil. Domestic oil production would be exempt from such a tax. A tax on oil imports is a good idea overall, but would not be without side effects. For instance it would likely encourage drilling for oil in places like Alaska's Anwar Arctic Wildlife Refuge. Maybe that wouldn't be the end of the world. American's tend to rail against the drilling consequences of oil consumption, but then drive home from the protest. 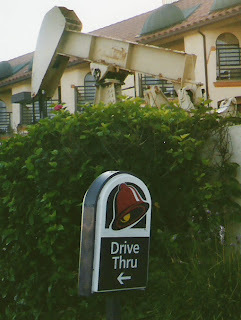 I saw this interesting juxtaposition of land uses during my 2003 bicycle trip down the west coast. This was in the Huntington Beach area. Ironically, very nice bike paths in that area. Much of Southern California has real nice paths along the beaches and other spots.